Not the best for a stock of vanilla effects presets, but if you´ve got time on your hands and want to get creative, consider SFX Machine Pro. Good sounding effects. Modular flexibility. Good MIDI learn functions. Some GUI issues in SX3 on the Mac. Preset Editor can be a head-scratcher. The Preset Editor gives you total control. The slider controls are genius. Use the VCS-3 to go all Eno. Over the years, effects processors and synthesizers have become somewhat standardised. The manufacturer often determines the signal path, and the user is stuck with whatever configuration the designer deemed to be most useful. For this reason, some musicians still prefer the flexibility of the guitarist's pedal board to the multi-effects processor, though the sound quality of stomp boxes is often questionable at best. A few effects manufacturers, such as Eventide and TC Electronics, have offered modular flexibility in their high-end rack-mounted devices, and it's hard not to be reminded of the old Eventide H3000SE when you start playing with SFX Machine Pro. 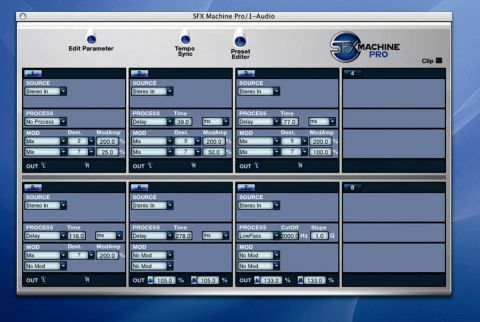 SFX Machine Pro is a modular effects processor for both Mac and PC. At $199, it's priced well below many popular effects suites, yet it offers just as many processors as some of these bundles. What's more, the effects can be arranged and rearranged as the user sees fit. All of this power is presented in a sensible and attractive (if somewhat generic) interface that comprises just two pages. Installation is dead simple, and the friendly copy protection procedure consists of nothing more than entering an authorisation code into a field on the demo version's GUI. Modular plug-ins can be a bit intimidating to say the least. SFX Machine Pro's rather clinical Preset Editor doesn't help ease the nerves - there are no virtual patch cables or any of the other software metaphors that are customary in modular applications. Thankfully, The Sound Guy have provided a thorough and informative user guide that will not only help you along the way but might provide you with a few laughs too. Upon opening SFX Machine Pro, you're met with the Slider Screen. On the left side of this is a preset browser, and the presets are divided into categories. They cover just about every sort of processing you can imagine, and when you select a category, its contents are displayed to the right. The right side of the Slider Screen is made up of - would you believe it - sliders. The array of sliders and the parameters they control change to reflect the selected preset. If you don't want to use your mouse to tweak your sounds, you can use SFX Machine Pro's MIDI learn capabilities. There were some issues with the interface when running SFX Machine Pro in Cubase SX3 on a G5 PowerMac. It was sometimes difficult to select presets and grab hold of the sliders using the mouse, and more often than not, SX3's preset browser was used to select patches. There were no such problems when running the plug-in in Live 5 or Logic Pro 7, though, and it also behaved perfectly in Sonar. If you feel inclined to stretch beyond the generous helping of over 300 presets that comes with SFX Machine Pro, you'll have to leave the comforts of the Slider Screen and head over to the Preset Editor. At first glance, this looks unassuming enough, but you'll want to keep the manual handy at first. Consisting of eight identical modules, the Preset Editor is used to define which effects to use on what inputs, and how your modulation sources and destinations will be routed. Each module consists of four separate 'blocks'. In the Source block, you tell SFX Machine Pro what that module's input source should be. It can come from your audio signal or you can choose a generated waveform such as white noise or a variety of synthesized waves. In the DSP Process block, you can analyse or use one of the various effects. These run the gamut from simple delays to filters to envelope followers, pitch trackers and more. Whatever comes out of the previous blocks can modulate other modules with the Modulation Block. Anything that can be synced to the host can be locked up with the click of a button. Finally, everything is delivered of the Output Block. All of this seems very simple on paper, but with functions like Raise to Power and Power Mod, the Preset Editor might be a bit intimidating for beginners. Thankfully, The Sound Guy have provided an excellent tutorial. Whether you use the supplied presets or roll your own patches, the results you get from SFX Machine Pro are excellent - unless you don't want them to be, that is. You may not be inclined to replace your TC and Lexicon reverbs with SFX Machine Pro, as clever users will create things to rival them. Bread and butter effects such as reverb really aren't SFX Machine Pro's forte - its appeal lies in its ability to create unusual processes that stretch the imagination. On this level, SFX Machine Pro is a winner. Although the basic palette of individual effects modules might initially seem a little anaemic, once you start combining the effects in the Preset Editor, the doors of creativity are blown wide open. If sound design or sample mangling are your bag, you're going to dig this.